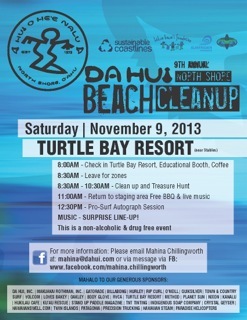 Everyone is invited to participate in Da Hui's 9th Annual North Shore Beach Cleanup on November 9. The cleanup will span the entire coast of Oʻahu's North Shore, from Haleʻiwa to Kahuku. Plastic Free Hawaiʻi will be focusing on the Kahuku Coast with teams at the Kahuku Golf Course and James Campbell Wildlife Refuge. All participants meet at Turtle Bay Resort Stables at 8:00am where busses will shuttle you to key cleanup locations. The cleanup will run from 8:30am - 10:30am and ALL marine debris will be transported back to Turtle Bay where it will be sorted. Method will be on-hand to assist with collection of hard opaque plastic for their Ocean Plastic dish + hand soap which is packaged in bottles made with a blend of recovered ocean plastic and post-consumer recycled plastic. For more details about the November 9 beach cleanup click here.